Uber Huber! : Where does Tilsiter come from? Where does Tilsiter come from? Where does the Tilsiter cheese actually come from, people ask? One thing is for sure though, the name originated from the then-German town of Tilsit, which is part of Russia since 1946 and is now called Sovetsk. It is also known that in the past, many Swiss emigrants worked in the vicinity of Tilsit or Tilsit itself as milk man, farmers and cheese makers. “Schweizer” is actually synonym for “Melker” - the man who milks the cows. According to the history, it is said that a merchant and farmer from the canton of Thurgau, upon his return from Tilsit, produced the first Tilsiter on his farm in Amlikon-Bissegg. Since the name “Tilsiter” is not protected it is also produced in other countries these days. 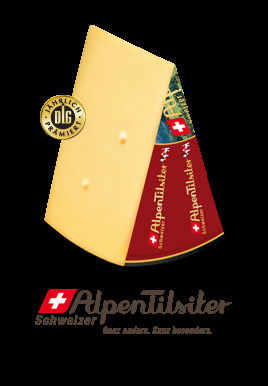 Currently, we are offering the Alpen Tilsiter made in Weinfelden which uses “thermitisierte” milk to produce a medium-firm textured cheese with irregular holes. Aged for up to 4 months, Tilsiter is great with hearty rye breads and dark beers. It is a great table cheese and may be eaten with salads, melted in sauces, on potatoes or burgers. Thermitisierte or Thermised milk is raw milk that has been treated less severely than pasteurized milk by heating it for 15 seconds at a temperature between 57 degrees celsius and 68 degrees celsius.